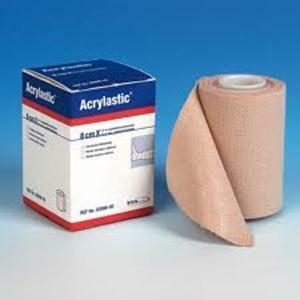 Acrylastic® is an elasticated adhesive bandage, woven from 100% cotton. It has a hypoallergenic, skin friendly adhesive and is permeable to air, allowing the skin to breathe. The latex free adhesive minimises the risk of skin reaction whilst high twist chain-link threads woven into the backing material provide strong compression and long term support.